he Investigations division of the Sheriff’s Office is comprised of three full time investigators, a Sergeant, and a Lieutenant. They are responsible for responding to emergency calls, for police services, traffic enforcement, and criminal investigations in the county, which covers over 4,300 square miles. James started in law enforcement in 1989 for the Hancock County Sheriff’s Department where he worked part time in corrections, dispatch, court security, and patrol while he attended the University College in Bangor and earned his associate’s degree in Law Enforcement. James also worked for the Gouldsboro and Ellsworth Police Departments as a patrol officer for several years prior to graduating from the Maine Criminal Justice Academy in 1995. 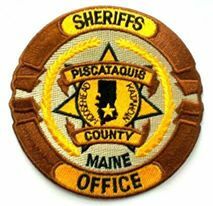 James was then hired by the Piscataquis County Sheriff’s Department in January of 1996 as an investigator. Since that time he has received training as a DARE instructor, school resource officer, and Accident Reconstructionist. James was promoted in February of 2013 to the rank of Lieutenant and currently resides in Sangerville. Michael served eight years in the Army as a medic prior to his law enforcement career. He was hired as a part time officer for the town of Dover-Foxcroft in 1986 and then was hired full time by the town of Milo in 1987. Michael came to work for the Sheriff’s Office as an investigator in 1991. Michael was a police K-9 handler from 1988 to 1996. In 2005 Michael was promoted to the rank of Sergeant with his duties to include the supervision of the patrol division. He has received training as the Sheriff’s Department crimes officer, CIT (Crisis Intervention Training) certified, and as the department’s training officer. Sgt. Gould resides in Sangerville. Guy started his law enforcement career in 1994 for the Greenville Police Department and graduated from the 81st Maine Criminal Justice Academy. Guy came to work for the Sheriff’s Department in 1997 as an investigator, and has received extensive training in the field of drug investigations. He drug investigations for the Sheriff’s Department have resulted in numerous large-scale drug cases and thousands of marijuana plants being eradicated over the years in Piscataquis County. He has also received training in latent fingerprint examinations, and elder crime investigations. Guy currently resides in Guilford. David began his law enforcement career in 1989 as a public safety dispatcher for the city of Hampden. David then left law enforcement in 1991 and worked in the private sector until 2001 when he went to work part time for the Dover-Foxcroft Police Department. David was hired full time for the Dover-Foxcroft Police Department in 2003 and was promoted to the rank of Sergeant in 2005. David came to work the first time for the Sheriff’s Department in 2007 as an investigator but left in 2010 to go to work for the Dover Police Department and Maine Drug Enforcement. David came back to work full time for the Sheriff’s Department in 2013 as an investigator. David has received training as a DRE (Drug Recognition Expert) and has extensive training in the drug investigation field. David currently resides in Bowerbank. Kyle began working in law enforcement in 2005 when he was hired as a part-time officer in Dexter and Brownville. In 2006 Kyle was hired full time as a patrolman for the town of Brownville. Kyle graduated from Husson university in 2007 with a bachelor’s degree in law enforcement. In 2010 Kyle went to work full time for the Dover-Foxcroft Police Department. He came to work for the Sheriff’s department in 2013 as an investigator. Kyle is a certified FTO (Field Training Officer), firearms instructor, taser instructor, and spike mat instructor.